Water damage is the most common form of property damage an owner can face. Even the best preventative maintenance can’t always stop water damage from occurring. All it takes is a leak in an appliance hose or a pipe over time and you’re facing water damage that has built up over time. 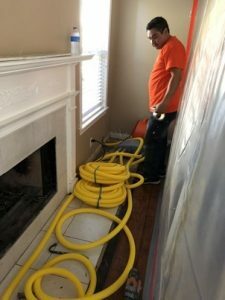 However, water damage comes from multiple sources that range from roof leaks to burst pipes, which not only results in immediate structural damage but also can lead to mold growth if not remedied fast enough. Mold only needs 24 hours to begin growing and spreading. If you’re suffering from property damage, call 911 Restoration promptly. We’ll be there within 45 minutes to take care of your emergency restoration. That’s our Fresh Start guarantee. We use the latest water extraction equipment and dryers to completely dry your property out. Plus, we can assist you with your insurance claim so that you can remain stress-free through the water restoration process. If you have water damage, call 911 Restoration immediately for your Fresh Start. We’ll be there within 45 minutes to begin working on your water restoration. In the middle of winter, property owners face an issue that is usually unnoticed until it’s too late. That issue is a frozen pipe. If left unaddressed, the frozen pipe causes the water pressure within to build up due to being unable to flow freely. Once the buildup reaches a certain point, that frozen pipe turns into a burst pipe. A burst pipe means instant flooding for your property. Since most pipes are near or in the basement, a flooded basement is quite common at this time of year. When faced with flooding, you need flood cleanup specialists to remove the excess water. The longer water is allowed to sit, the further it spreads and the more likely that fungi and mold will be able to grow. If your property has a burst pipe, call 911 Restoration promptly for your flood cleanup. We’ll be there within 45 minutes to deliver a Fresh Start. A sewage backup is a serious issue for property owners. This situation occurs primarily due to a buildup of pressure in the city’s sewer system. Once the pressure becomes too much, the toilet could overflow or a septic pipe can burst which causes an influx of sewage water to strike the premises. Professional sewage cleanup is needed due to the raw waste within the sewage water. The raw waste turns the water into black water, which is a class 3 hazardous material. That’s why we wear hazmat gear when handling your sewage cleanup. We use industrial grade detergents and cleaners for decontamination before proceeding with our multi-step water extraction and drying procedure. We take your health and safety seriously so cutting corners isn’t an option with your sewage cleanup. If you’re experiencing a sewage backup, call 911 Restoration promptly. We’ll be there shortly to handle all aspects of your sewage cleanup from start to finish for your Fresh Start. A mold infestation occurs over time with enough exposure to moisture within the property. Excess moisture in a dark environment makes for an ideal environment for mold to grow in. Mold causes damage in two ways. Number one is the destruction of organic materials within the property. Number two is the impact your health. Mold is an allergen that causes breathing issues and headaches at a minimum. 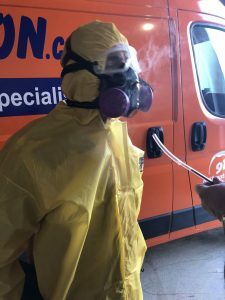 As part of an effort to keep you healthy, we use the latest containment measures to isolate the mold before going through our mold removal process. We believe in being thorough and getting the job done right the first time. That’s why part of our mold removal process includes checking for moisture and drying out the property to keep mold from reoccurring. If you suspect mold, call 911 Restoration immediately for your mold removal. We’ll handle your mold remediation in full to deliver the Fresh Start you need today! Fire damage is devastating for property owners from the initial fire to the fallout after the fire is put out. Fire leaves behind smoke, ash, and soot along with water damage for the property owner to contend with. That’s why after a fire you need professionals to handle your fire damage restoration. Put yourself in the hands of professionals who know what they’re doing. Call 911 Restoration today for your fire damage restoration and get the Fresh Start you deserve! As is the nature with disasters, they can strike at any time day or night. Disaster can occur due to a violent storm, flood, or fire and cause a multitude of problems for the unprepared property owner. However, we are standing by ready to assist 24/7/365 to make sure that your disaster restoration is as smooth as possible. Our techs are trained and IICRC-certified to handle all aspects of your disaster restoration. 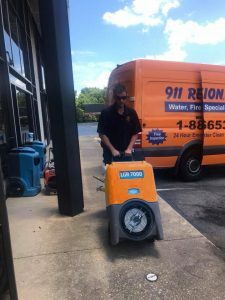 We will address your water damage, mold removal, fire damage, and even restore your home to good as new. Plus, we can help with filing your insurance claim so that you get the financial support you need in a trying time. If you’re in the throes of a disaster for your property, call 911 Restoration today to handle your disaster restoration. 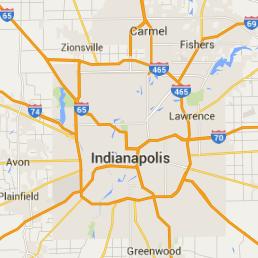 We’ll be there within 45 minutes to steer you towards a much needed Fresh Start.